Hebden Bridge is a lovely market town in West Yorkshire about 8 miles from Halifax and takes its name from the packhorse bridge over Hebden River (Hebden Water). The town lies at the confluence of the River Calder and River Hebden and forms part of the Upper Calder Valley and is known as the Pennine Centre. In the late medieval times the town developed as a river crossing and meeting point of packhorse routes from Halifax to Heptonstall, Burnley and Rochdale and its main industry was textiles. 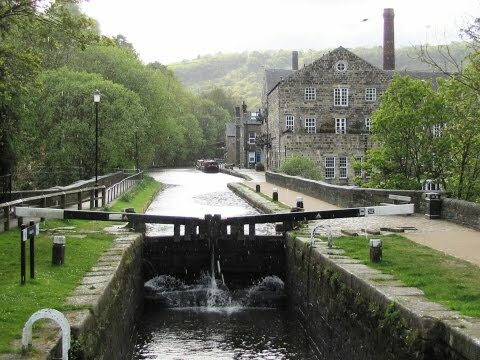 The Rochdale Canal that runs through Hebden Bridge was the first of three Pennine crossings to be completed and opened in 1804. The canal runs for 33 miles between Sowerby Bridge where it joins the Calder and Huddersfield Canal and Manchester where it joins the Ashton and Bridgewater Canal. The railway brought closure to the canal in 1937 but has now been restored and reopened to navigation in 2002. Hebden Bridge was a mill town producing wool and woollen goods until its severe decline by the end of the sixties. In the 1970’s and 1980’s the town became very popular with artists, writers, photographers, musicians, alternative practitioners, teachers, green and new age activists and wealthy yuppies all wanting to escape the cities to live a mixture of urban and rural life. In recent years Hebden Bridge has under gone a major clean up, sand blasting and revitalising the buildings etc making the town a great place to visit. There are many rights of way and within 10 to 30 minutes walk from the town you can stroll along the river side, amble through the wooded valleys or be in the heather moorland of the hills that surround this surprising little market town. Hebden Bridge also lies close to the Pennine Way and Hardcastle Crags provides not just walking but climbing and cycling too. Hardcastle Crags, owned by the National Trust, is comprised of two wooded Pennine valleys Hebden Dale and the valley of Crimsworth Dean which connect at right angles at Midgehole and Scackleton Knoll at 423 metres separates the valleys to the north. Hebden Dale is a beautiful wooded valley with waterfalls, weirs, lots of wildlife and Gibson Mill a 19th century cotton mill has also been renovated and reopened to the public in September 2005 with a shop, cafe and toilets. The mill was water powered and now uses sustainable energy from the river, sun and wood. It is situated about half a mile up the valley and is surrounded by 400 acres of unspoilt woodland. Crimsworth Dean is a Special Site of Scientific Interest dotted with old listed farmhouses and the views are idyllic. Hardcastle Crags is an area so well worth a visit, we were very surprised not knowing what to expect. For disabled visitors there is limited pre-bookable parking at Gibson Mill and the shop, cafe and toilets are accessible. There is also a track to the side of the Midgehole information point going to Gibson Mill and is one mile. We park at Midgehole National Trust car park. We walk down the path at the side of the road going back towards Hebden Bridge to the information point. Here we turn left and immediately right following the sign for Gibson Mill. We follow the path along side Hebden Water (river) which is on our left through the woodland and just after some stepping stones the path splits and we take lower path going off to the left steeply down some steps taking us close to the river. We pass a weir and after a short way we take the steep steps back up to the top path. We continue forward on the path, the Haworth to Hebden Bridge Walk, taking us to and from the river and as we walk along we pass a second weir and then some stepping stones at a seat and keep heading forwards. We then pass some more stepping stones with a seat and some buildings on the other side of the river and then past Hebden Hay picnic area we can also see on the other side of the river. We soon arrive at the buildings of Gibson Mill. We take a look round and then investigate the mill pond and waterfalls at the back of the mill. We then rejoin the main track still with the river on our left. We soon pass the crags that give the woods their name and continue on the main track going slightly uphill. When the track splits we take the right fork. We eventually leave the woodland and onto a tarmac track following this to Walshaw, not far after crossing a little bridge going over a stream. At Walshaw we take the sign posted track on our right going back on our selves. We go through the gate and walk between two walls taking us into an open field. We go through the next gate a follow the track up to the wall and round the side of Scackleton Knoll which we can see in front of us. The views are amazing. We follow the wall for a short way then go through the gate in the wall and follow the wall on the other side. After a short way we come to a sign post and go through the gate on our right. We now head downhill on a wall track into the valley of Crimsworth Dean. We pass a derelict farm house on the right and at the next derelict farm house on the left there is a sign post Calder Aire link, St. Ives, Bingley 14 miles to the left but we turn right through the gate with a plaque on the post South Pennine Pack Horse Trail. This track is the Haworth to Hebden Bridge walk. We continue on the elevated path then pass through a gate at the farm on our left. We carry on following the track and go over a cattle grid into the National Trusts Crimsworth Dean woodlands. When the track forks after a field we bear to the left and after passing two cottages the track becomes a tarmac track and we soon arrive back at Midgehole car park. This is an easy to moderate walk with good paths and tracks. Inclines and declines are moderate. Approx 5 miles starting at Midgehole car park using OS map OL21 South Pennines. Midgehole is on the outskirts to the north of Hebden Bridge, West Yorkshire. There are two car parks at Midgehole the first one is for National Trust members only and the second one at the end of the road is for non-members which is pay and display. Hebdon Bridge is situated on the A646 between Halifax and Burnley. From Hebden Bridge take the A6033 towards Haworth and Keighley for just over a mile and take the small road on the left sign posted Hardcastle Crags and Midgehole. The car park is at the end of this road. There are public toilets near the car park costing 20p and free ones at Gibson Mill. For refreshments there is a cafe and shop at Gibson Mill. In Hebden Bridge there are plenty of shops, pubs, cafes, fast food and restaurants. of his catch. i really enjoyed your video and look forwards to seeing somemore. Thankyou for your comments it was nice meeting you and thanks for suggesting Wycoller. We are going to look into it as we have never been there. On our video “Glastonbury Tor” in Somerset we were walking through the Somerset Levels and were lucky enough to film a heron catching, killing and swallowing a mouse or a vole. We did not know that they ate mammels and thought this might be of interest to you. We also found some giant fresh water muscles the size of your hand. Love the sights and the pictures. The heron is also beautiful in its own right. Thanks for the uploads. Thank you for your kind email. We had never been to Hebden Bridge before and we were lucy enough to film the bluebells and the crag before the floods. which we were very gratefull for. Thank you we will check out Marsden and Sowerby Bridge.